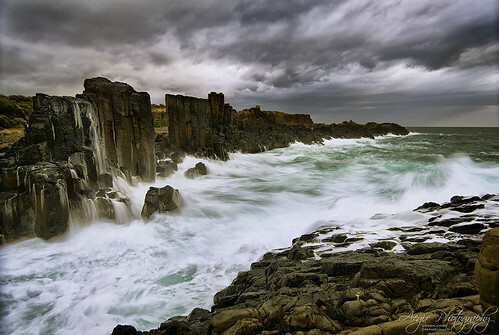 This was my 3rd visit to Bombo quarry (about 2 hours south of Sydney) and finally I got a decent sky. Although the tide was on the way out a 2 metre swell provided some nice wave impacts. A southerly breeze helped keep the salt spray off my filters. A great spot for lovers of great ocean swells and interesting rock textures. Nikon D800, Nikkor 16-35mm, Lee 1.2 GND filter. PP in PS CC using Nik Software and luminosity masks.